Grow a dramatic mix of sunflowers with this easy DIY kit that includes six different heirloom varieties. The drama queens of the garden, sunflowers visually dominate it. So much impact, for so little work! 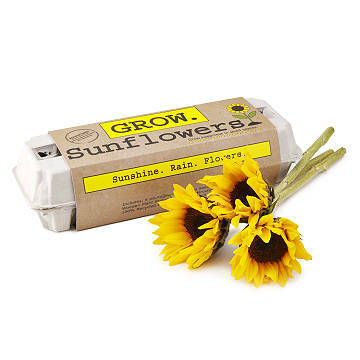 This kit includes everything you need to start your own sunflower patch, including seeds for six heirloom varieties in an incredible range of colors, shapes, and heights. Among the easiest flowers to cultivate from seed, sunflowers are especially exciting as a child's first gardening project, because they grow so fast and get so tall. (The Classic Mammoth, included, reaches 9-12 feet, with enormous blossoms.) They're the closest thing we know to planting pure happiness. Assembled in Covington, Georgia.